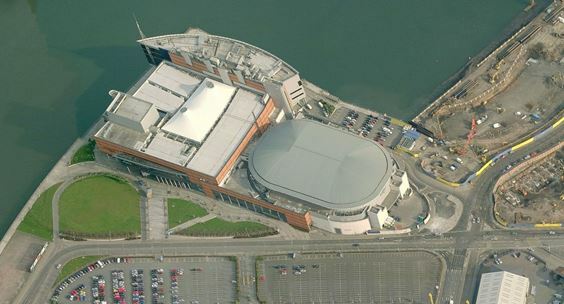 SSE proposed the development of rooftop solar photovoltaic panels on the SSE Arena in Belfast, Ireland. As part of the application, a request from Belfast City Airport was received for a Glint and Glare Assessment with respect to aviation infrastructure. 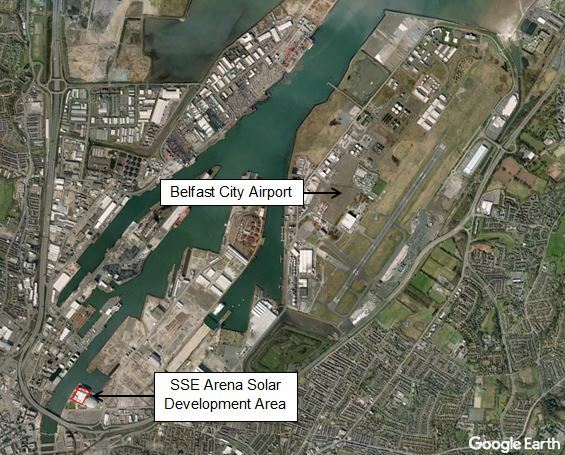 Belfast City Airport’s concerns related to the possibility of solar reflections from the solar panels affecting pilots in aircraft as they approach the airport and controllers in the Air Traffic Control (ATC) Tower. It was therefore Pager Power’s role to assess the proposed rooftop solar development to determine whether any significant detrimental impact was expected and mitigation required. Glint and glare is a key issue for aviation safety in Northern Ireland. If a solar development is to be located in the vicinity of an aerodrome then a glint and glare assessment is likely to be requested. The SSE Arena solar development is located approximately 2.4km southwest of the threshold for runway 04. The proposed rooftop development will consist of approximately 1,400 solar panels with a rated power of 420kWp. 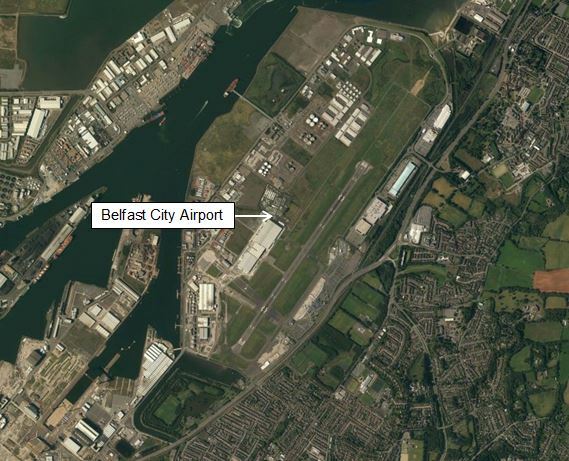 Pager Power was engaged to investigate the effects of glint and glare by undertaking geometric solar reflection calculations with respect to Belfast City Airport’s runway approaches and the Air Traffic Control (ATC) Tower. The rooftop solar development was split into four distinct areas of varying azimuth angles. This meant that the solar panels in each area would be producing solar reflection in different directions at any one time. Each solar panel area was assessed via two solar refection models, Pager Power’s model and the Sandia SGHAT model. If a predicted solar reflection was of intensity greater than ‘low potential to produce a temporary after-image’ for the approach paths, then a significant impact would be expected. The intensity of glare deemed acceptable for approach paths, based on Federal Aviation Administration (FAA) solar glint and glare guidance, is ‘low potential for temporary after-image’. The ATC Tower was assessed for completeness however at approximately 2.5km northeast of the solar panels, no view of the solar development was expected. The FAA guidance states that no solar reflection towards the ATC Tower is permitted. The Civil Aviation Authority (CAA) is yet to produce detailed glint and glare guidance and therefore many aviation stakeholders adopt FAA guidance. The results of the model showed that the proposed solar panel layout would produce, at worst, a solar reflection with a ‘low potential for temporary after image’ towards a small part of the final approach path for runway 04. No solar reflection was geometrically possible towards the ATC Tower and therefore no impact was expected. The report was then passed onto Belfast City Airport who subsequently agreed that no significant impact was expected and the objection to the rooftop solar development was removed. Following submission of the analysis and removal of the objection, planning permission was granted in late 2016. The solar panels are to be installed in early 2017. The solar panels are expected to have a capacity to generate over 300MWh of green electricity per annum, which is equivalent to around 6% of the total annual electricity load at the SSE Arena. This project showed that rooftop solar photovoltaic development could receive an aviation-based glint and glare objection when located in close proximity to an aerodrome. If this happens, the first thing to do is to assess glint and glare with respect to key aviation receptors, which is likely to include approaching aircraft and the ATC Tower. Additional receptors may also be requested by the relevant stakeholder. If the results prove to be significant, then the next step is to review mitigation techniques, which can include revising the layout. Source: © 2016 Bing. © 2016 Blom. Source: © 2016 Infoterra Ltd and Bluesky. © 2016 Google. 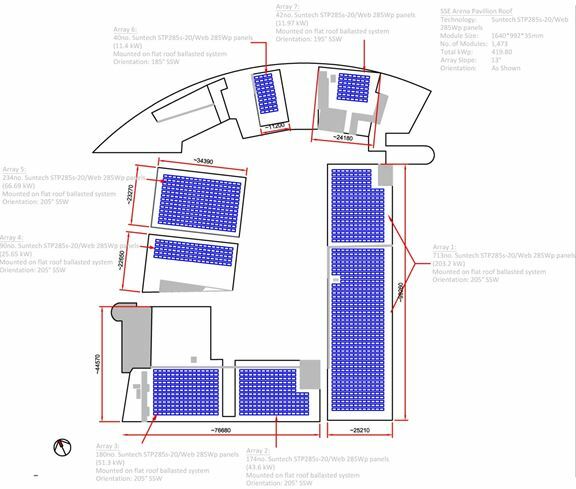 SSE Arena Belfast to go solar with large commercial rooftop, 27 October 2015. Liam Stoker, Solar Power Portal. Last accessed 08.11.2016.